As I was preparing for my summer vacation, I realized I needed a new beach chair. The one I had was starting to rust, the seat fabric was fraying, and it was difficult to unfold no matter how much WD40 I sprayed on it. I thought this would be a 10-minute errand, taking longer to drive to the store than it would for me to select and pay for my chair. Clearly I hadn’t shopped for a beach chair very recently, though, because there were what seemed like dozens from which to choose. They all looked pretty similar at first glance, but upon closer inspection there were many varieties: chairs that sit low in the sand, chairs that sit high; ones that recline and others that lie flat; chairs that are backpacks, have coolers built in, or have wheels. My shopping experience made me curious about the origins of the beach chair, and whether the design had changed much over time. My research led me first to the story of Wilhelm Bartelmann, a German basketmaker who invented the “strandkorb,” a wicker chair designed for the beach. In 1882, the basketmaker is said to have been approached by a woman who had been advised by her doctor that sea air would be good for her—but that she was not supposed to sit on the sand because of another ailment. She asked if Bartelmann could create a chair that would allow her to enjoy the beach while keeping her off the sand. Thus, the strandkorb was born. The basket-like chair provided comfortable seating on the beach, while also protecting its users from sun, sand, and wind. The next year, Bartelmann began making two-seater chairs, and also established a successful strandkorb rental business. Wilhelm Bartelmann seated in a strandkorb with his wife Elisabeth and their children. Image courtesy of Bartelmann.com. 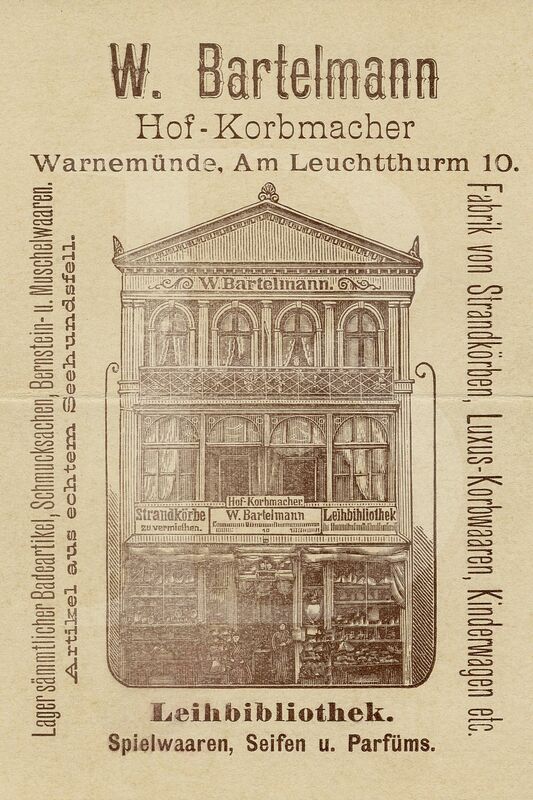 Advertisement for Bartelmann’s strandkorb business. Image courtesy of Bartelmann.com. So what about beach chairs in the United States? 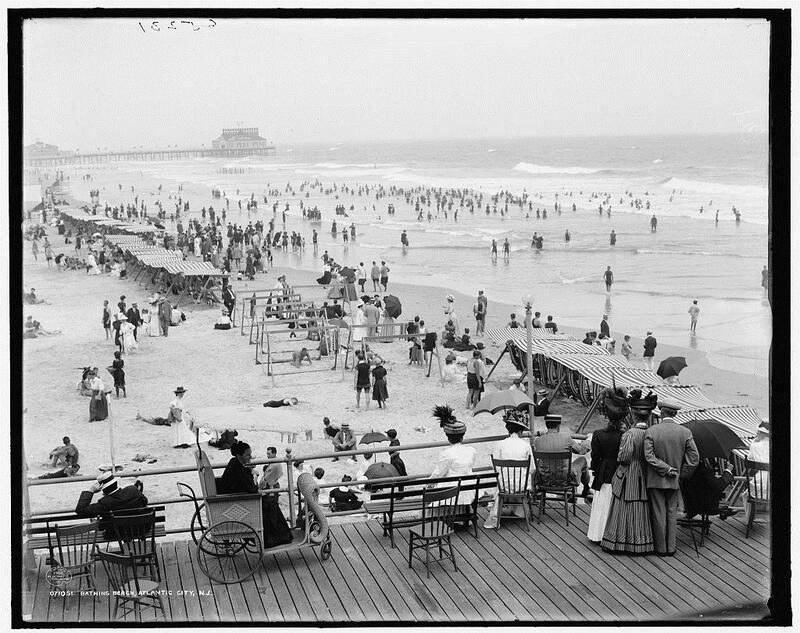 Canopied chairs like the strandkorb were certainly used in the US, but I was curious to learn whether there were other designs that would look more familiar. 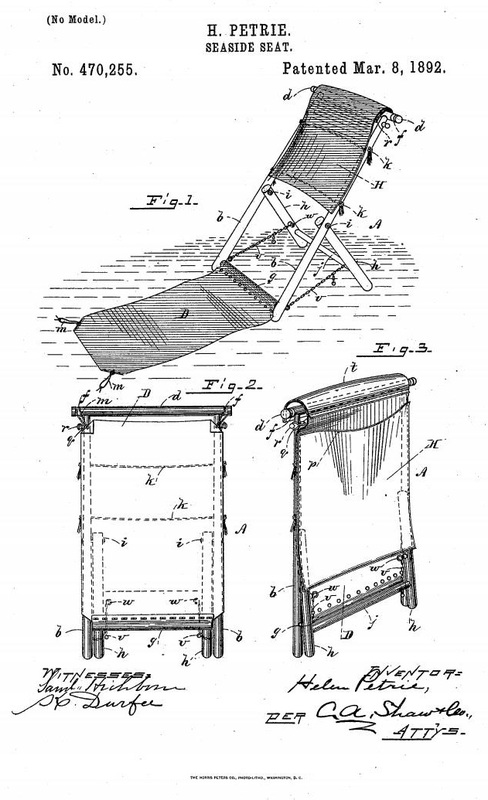 The earliest patent I discovered that specifically mentions a chair for the beach is Helen Petrie’s 1892 “Seaside Seat.” While there are other, earlier US patents for folding, reclining, and convertible chairs, Petrie’s patent (number 470,255) specifically references the beach: “My invention relates especially to a foldable reclining seat or lounge for use in camps, on yachts, at beaches, and in similar places.” Unlike Bartelmann’s rather substantial chair designed to shield the user from the elements, Petrie’s design appears open, more compact, and easily movable—not unlike many of today’s beach chairs. 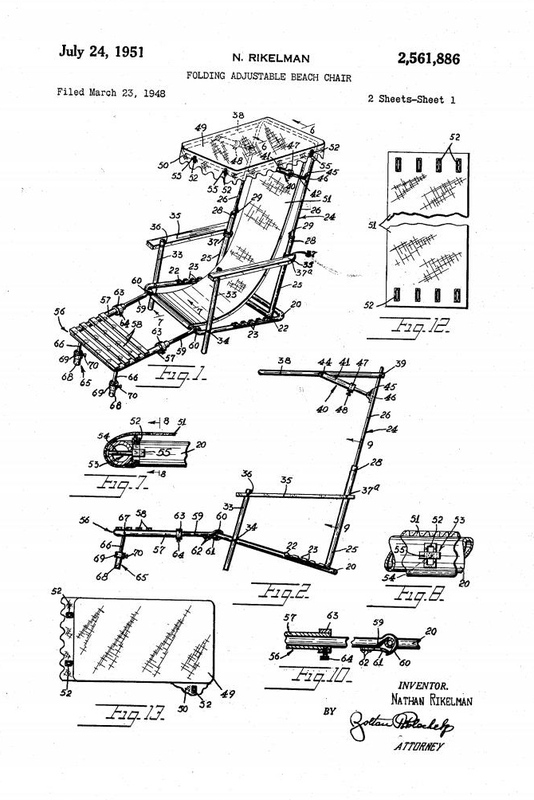 Drawing for Nathan Rikelman’s 1951 patent “Folding Adjustable Beach Chair.” One of the first references I found to an adjustable chair. 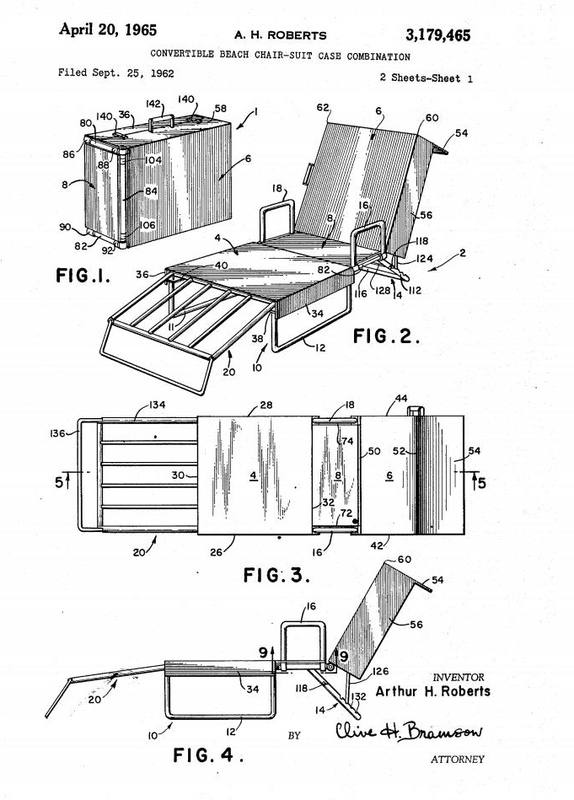 Drawing for Arthur H. Roberts’ 1965 patent “Convertible Beach Chair-Suit Case Combination.” Think of all the gear you could take to the beach with this! Inventor Michael Deming and his wife Karen. Deming was inspired to invent a wheelchair that could be used on the beach after Karen was in an accident which left her a quadriplegic. Deming completed his prototype in 1994 and was awarded a patent for an “All-terrain Wheelchair” in 1997. Image courtesy of Beachwheelchair.com. Shannon Nation with her “Pregnancy Beach Chair.” When she was pregnant, Nation was frustrated that she could not comfortably lie on her stomach on her beach chair so she invented her own solution! The chair has a hole for a woman’s pregnant stomach. 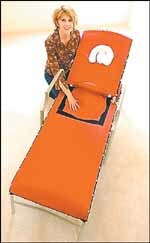 The hole can also be covered by a piece of fabric attached to the chair with Velcro. Nation received a patent for her idea in 2001. My new backpack beach chair. 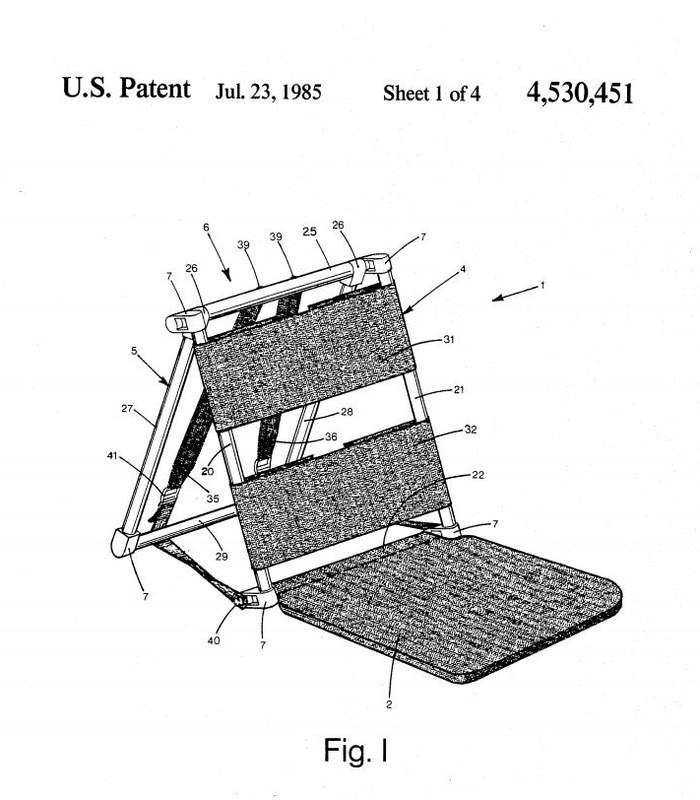 James Hamilton received a patent for a “Combination Backpack/Beach Chair” in 1985. Thanks, Mr. Hamilton, for making my vacation to the beach both comfortable and convenient! Drawing for James Hamilton’s backpack/beach chair patent.